Easy Italian chicken and veggies foil dinners are the easiest dinner! 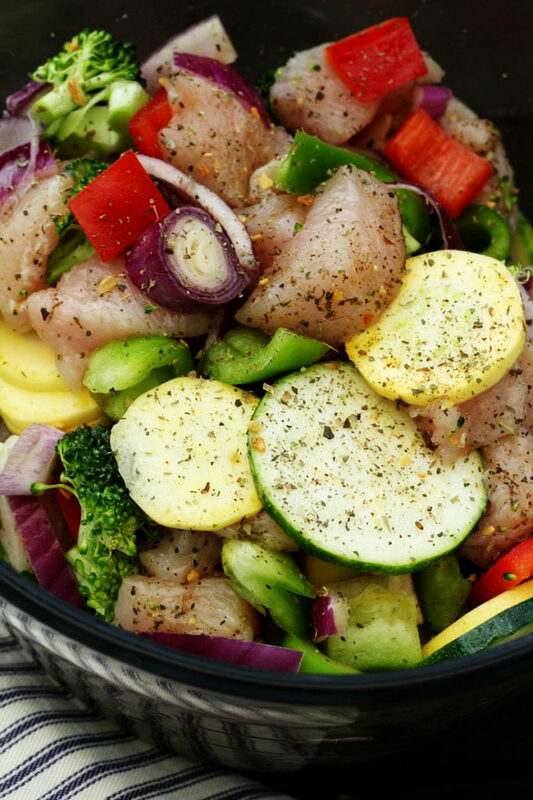 Just chop the ingredients and toss them with olive oil and spices! Place them on the foil and put them in the oven. These are a delightful dinner. Everyone gets their own personal foil packet and it makes for an easy clean up. That is another reason that they are so wonderful. Plus they are healthy and they taste great. Now you will have the best of both worlds. Twenty minutes in the oven isn’t too bad, and if you like, you could place them on your grill. I am just not sure as far as the timing goes on the grill because I have never used the grill, but you would just need to make sure that the chicken is cooked all the way through. My son paid me a nice compliment the other day and it went something like this. He just started a new job and he took his lunch, which was leftovers and that is a miracle in itself, because he doesn’t care for leftovers. The guy that was sitting next to him asked him what he was having for lunch and my son said, “a meatball submarine sandwich”. And then he asked his co-worker what he was having and he said, “a peanut butter sandwich”. Hmmm. Which one would you rather have? So then when my son came home and told us the story he said that sometimes he feels kind of bad for other people, and how blessed he is. Then he asked another friend if her mom cooked every night and she told him “no, only 2 or 3 times a week. I must admit that I use to be a lot better. Now, I only cook about 3 or 4 times a week. It is different when you only have 4 of you in the house instead of having 7 of you, and a lot of the time, 2 of them are not around. So, it is usually just 2 of us. Another reason that I made Easy Italian chicken and veggies foil dinners is because one of my children has (SIBO) small intestinal bacteria overgrowth. They put you on a pretty strict diet when you have that. 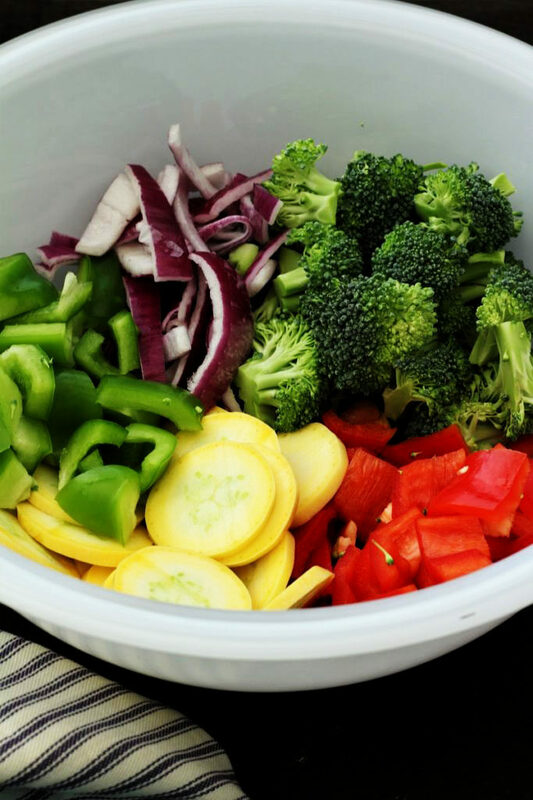 They suggest that you eat a lot of vegetables and herbs. If you wanted, you could also add more vegetables to the Easy Italian Chicken and Veggies Foil Dinners; we do not want anyone going hungry. For those of you who have never heard of SIBO, it is similar to IBS. Your food does not digest well and you will get a lot of cramping and bloating. Not fun! So we are working on helping improve the digestive track. One thing that I look back on is that she had to have gum grafts, and I do know that a lot of our heath problems start in the mouth. So if you have a child with a lot of mouth issues, be so careful that it doesn’t turn into something else. 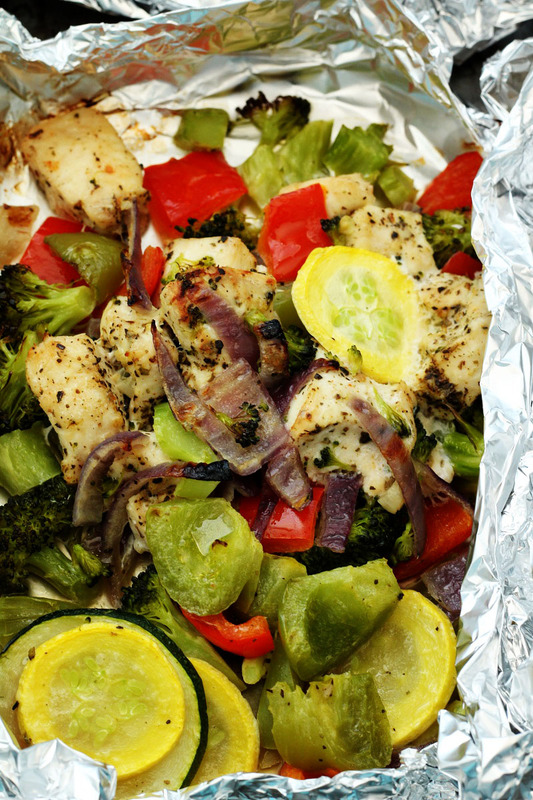 But just remember that Easy Italian chicken and Veggies Foil Dinners are a great lunch or dinner. Stay healthy and enjoy your summer! Salt and pepper sprinkled on top of each packet for taste. I just sprinkled each one just a little bit. Cut vegetables and chicken. Place into a medium to large bowl. Cut 4 pieces of aluminum foil into square pieces. (About 12" x 12" each). In a small bowl combine the oil, garlic, and the *Italian seasoning. Place the seasonings and oil on top of the chicken and vegetables. Mix until the veggies and chicken are nicely seasoned. Divide the mixture into fourths and place each fourth onto a piece of the foil. Place them on a baking sheet to cook and bake @ 400 degrees. If you like, you can serve over rice or noodles. * Make your own Italian seasoning by combining: ½ teaspoon dried sage, ½ teaspoon rosemary, ¼ teaspoon basil, 1 teaspoon oregano, 1 teaspoon thyme, and 1 teaspoon marjoram. 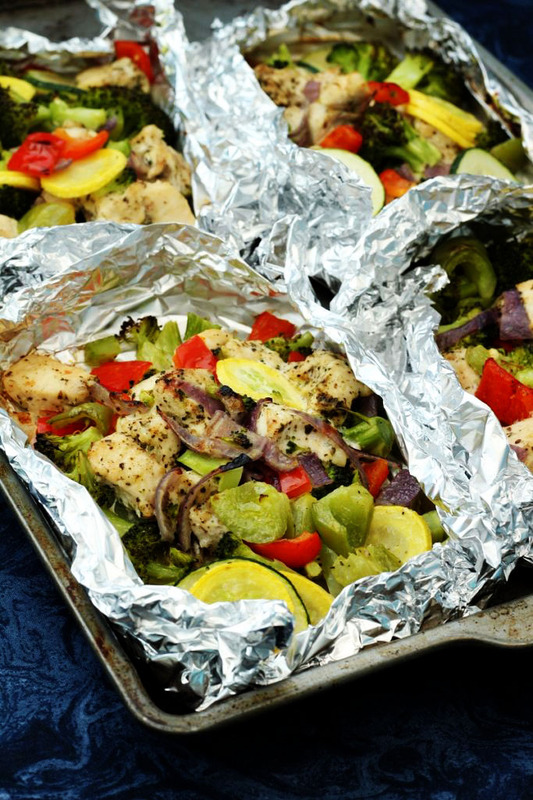 We love veggies and chicken and cooking them in a tinfoil dinner is wonderful. Yes I know about that peri menopause. I have been trying to eat healthier too. Good luck to both of us! These look yummy and I love that everyone can have their own because I love spice and my stepson doesn’t. And your son is so sweet 🙂 a testament to how he was raised!! Kelly, you are the sweetest! We hope that we are raising these kids right! Thank you for your sweet words! Enjoy your foil dinners. This looks delicious and I love that it’s all cooked in the foil pouch. Thanks for sharing at Snickerdoodle. Pinning. We love foil dinners, and this one is a good one. Thanks for coming by and leaving a comment. Looks good! Thanks for sharing at To Grandma’s House We Go DIY, Crafts, Recipes and More Wednesday Link party! Pinned! Hope to see you next time! Thank you for the support. Link parties are the best. Have a great week. I keep thinking I should do more foil packets and now I know I should. Yum! I love how easy they are! I hope that you get a chance to try them. Are you enjoying your summer with little dude? Thank you for your support Carlee! Thank you for hosting. We appreciate your hard work.